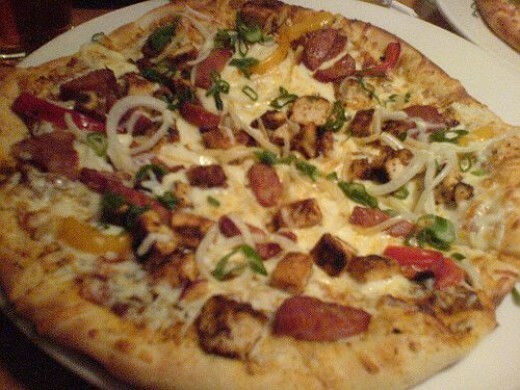 Here is a restaurant copycat recipe for California Pizza Kitchen's Cajun pizza. This pizza is made with blackened chicken, spicy andouille sausage with a creole sauce, red & yellow peppers, onions and mozzarella cheese topped with green onions. Read on to learn how to make this pizza at home using simple ingredients and limited cooking skills. I've never had much luck at making homemade pizza dough so I found the prepared pizza shells pictured to the right at Walmart for less than $2 a piece. Another quick tip to making this pizza is to use leftover rotisserie chicken from the deli. It's already cooked so all you need to do is add come Cajun spices. In a small saucepan, stir cornstarch into cold water until dissolved. Add remaining ingredients blend well. Cook and stir over low heat 3 to 4 minutes or until sauce is bubbly and thickened. Preheat oven according to shell directions. Shred chicken in a small bowl and drizzle with creole sauce. Remove sausage from casing and fry in a skillet until brown. Slice peppers, onions and scallions. 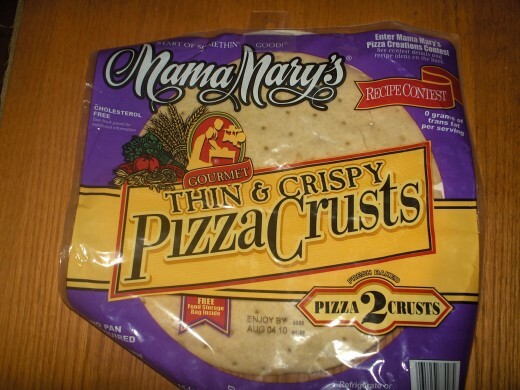 Build the pizza by putting a thin layer of creole sauce on the shell. Add the cheese, chicken, onions and peppers. Cook according to shell package.